We ship all our Kabloom products via Royal Mail First Class or courier (UPS or DPD) for larger orders. We are a very small company with limited resources i.e. no big dispatch warehouses like Amazon! However we aim to dispatch your order as quickly as possible. Our orders usually leave our premises within 2 working days and should arrive within 1-2 days of dispatch (in the UK) via Royal mail. Please note this service is not track-able and we are unable to guarantee an order will arrive within this time scale. If you need an order to arrive express or by a certain date, please email us and we’ll confirm if we can help. Busy periods: Please note that during busy periods such as beginning of spring and pre-Christmas season dispatches are likely to take longer to dispatch. Usually 3-4 days rather than the usual 1-2. For orders outside the UK please allow up to 10 working days for delivery. Unfortunately we do not currently send our products outside Europe due to seed import/export restrictions. We do our best not to charge any more than we need to for delivery. Our rates are based on what is required to cover the postage and packaging costs and as our products are mostly small and light there is very little variation in price. Please return all items in original condition in the appropriate packaging. Should your goods arrive damaged, please include photographic evidence. This will help speed up the process. We recommend you use a ‘signed for’ delivery service and obtain proof of postage. Refunds are credited to the same account and in the same manner as the original purchase, once we have received the return. We will process your refund or exchange with in 14 days. 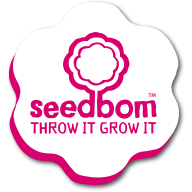 Before you return anything please email us at hello@kabloom.co.uk with the following details: Your order number, your contact details, whether you would like a refund or exchange and some details of why you are returning your order.